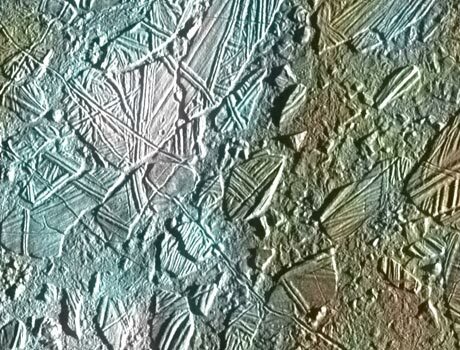 This close-up image of Jupiter's moon Europa was taken by NASA's Galileo spacecraft. It shows a small region of the thin, disrupted, ice crust known as the Conamara region. It clearly shows the interplay of color with the many intricate ice formations in the crust. The dark colored areas on the ice are formed by rock and mineral contaminants in the ice that may have been brought to the surface from deep beneath the ice crust. The lighter blue and white colors are areas where fresh water ice particles have been recently ejected to the surface.